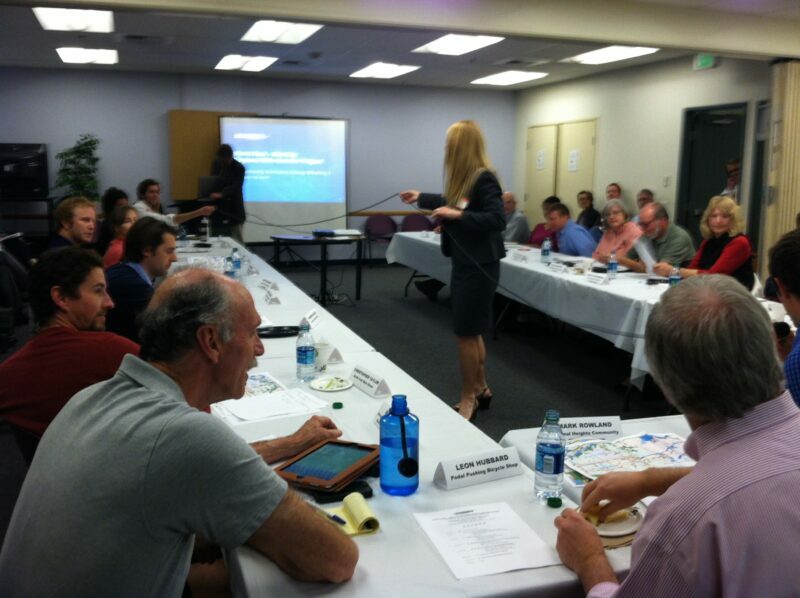 Two Wednesdays ago SANDAG held the first Community Advisory Group meeting to address the North Park – Mid-City Regional Bike Corridor Project. In attendance at the City Heights Wellness Center were District 9 City Council Member Marti Emerald, multiple Active Transportation Planners from SANDAG, Community Advisory Group Members and members of the general public. Project Manager, Bridget Enderle, explained that the purpose of this first meeting was to reach out to the community in order to brainstorm, help identify opportunities and facilitate broad community involvement in the planning process. 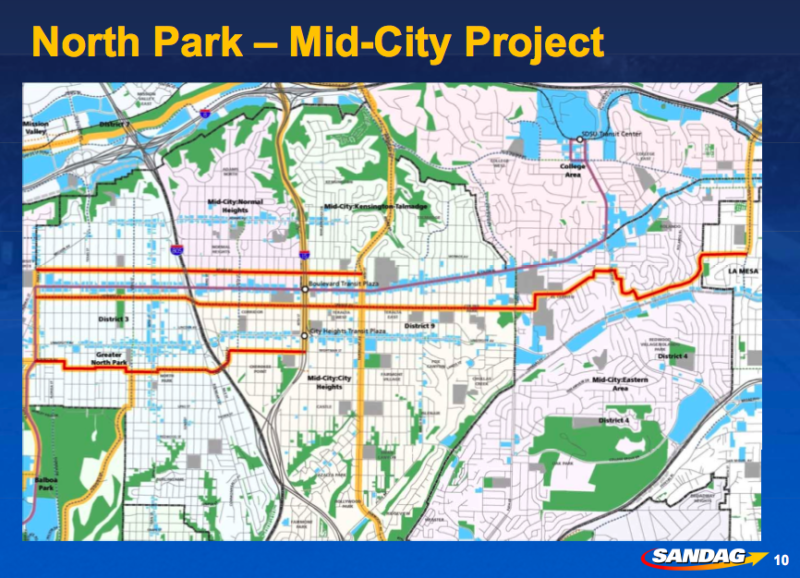 The SANDAG Project Team identified areas within Greater North Park – Mid-City that they think provide the biggest benefits and possibility of getting more people biking. A map was distributed with streets highlighted to indicate high traffic destinations and others highlighted to indicate proposed urban bikeways. Three preliminary corridors were presented as possible routes: Meade Ave Corridor, Howard/Orange Ave Corridor and Landis St Corridor. The audience was quick to note that all three are East/West routes and the presentation lacked any major North/South connectors. Most everyone agreed that safety is one of the main issues in getting more people riding and that routes need to connect to key destinations. Beryl Forman, of the El Cajon Business Improvement District, suggested that the project “should be a balance between comfortable side streets and main streets”. Scott Kessler, Executive Director of the Adams Ave Business Association, agreed that we shouldn’t limit ourselves. “We need a comprehensive grid. People don’t want to ride a mile south to take a bike route.” BikeSD’s own Samantha Ollinger stated, “cyclists should not be treated as second class citizens. They should be given the same rights as other modes of transportation.” Other community members gave more specific input such as the use of alternate, direct routes like El Cajon Blvd rather than the meandering side streets found in the eastern portion of the proposed Orange/Howard Corridor. Further suggestions included the use of canyons and the creation of linear parks and roundabouts to promote traffic calming and livable streets for the entire community. Council Member Emerald called on the community to “think big” and “think different”. While the SANDAG Project Team plans to have something built within the next three years, they have outlined the next steps toward implementation of the project. The next meeting to address existing conditions within the corridor is scheduled to take place this spring followed by two meetings/community workshops on alignment and design alternatives, and preferred design in the summer and fall. WAHT?!?!?! Mid-City wants a LIVEABLE neighborhood? Are people in San Diego finally getting tired of their neighborhoods being doormats for surrounding residential and commercial areas? Interesting… A hundred years ago, automobiles were expensive luxury items and most people walked, biked, or used public transit to get around. Seems like we need to get people back into the mindset of using our streets the way they were designed, doesn’t it?